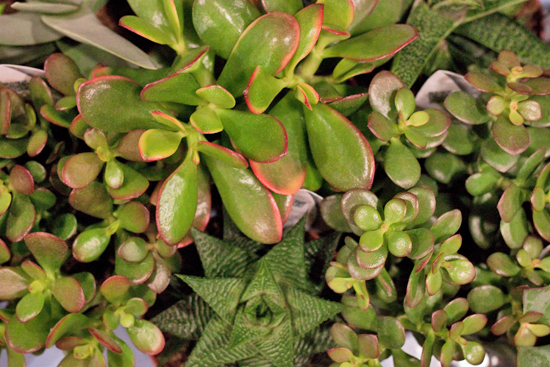 Gaining in popularity over the last few years and appearing not only in wedding designs, but also in gift bouquets, contract work and even jewellery are these wonderful plants…succulents! The trend for using them at weddings appears to have originated in the States and it’s now whole-heartedly reached our shores, with brides-to-be in the UK fond of incorporating them into their special day. 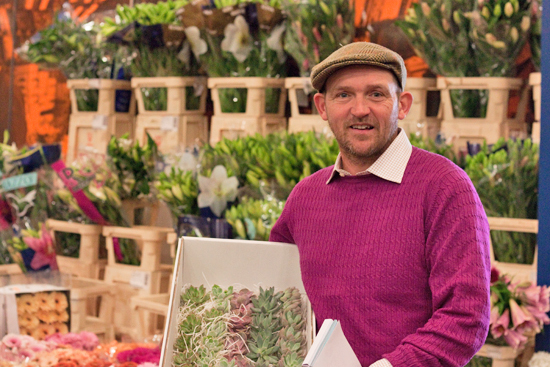 Let's take a look at varieties that you can find at New Covent Garden Flower Market. Succulents fall within the Crassulaceae family, of which there are six subfamilies - Crassuloideae, Kalanchiodeae, Cotyledonoideae, Sempervivoideae, Sedoideae, and Echeveroideae. 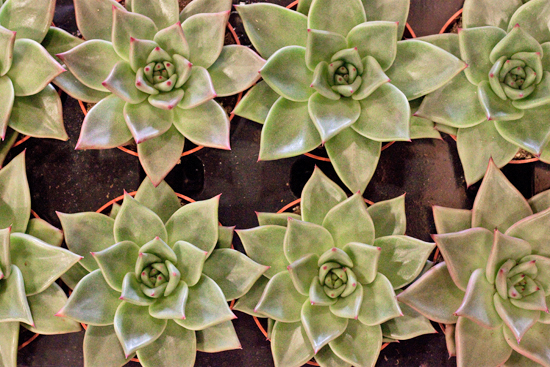 The word succulent is a descriptive term given to plants that store water in their leaves or stems. Long-lasting and easy to look after, they're sold either as cut or as plants and are available all year round. There are lots of different varieties. We'll be concentrating on Echeveria and Crassula ovata. 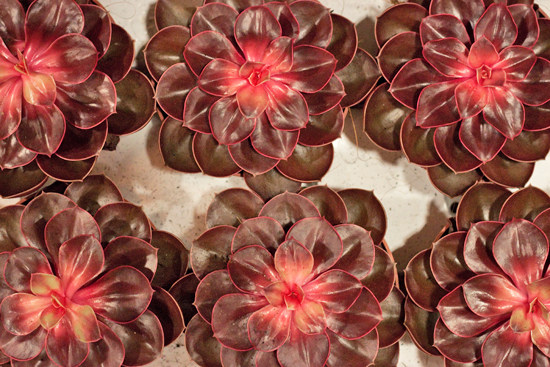 But you can often find Sempervivum and Kalanchoe at the Market too. 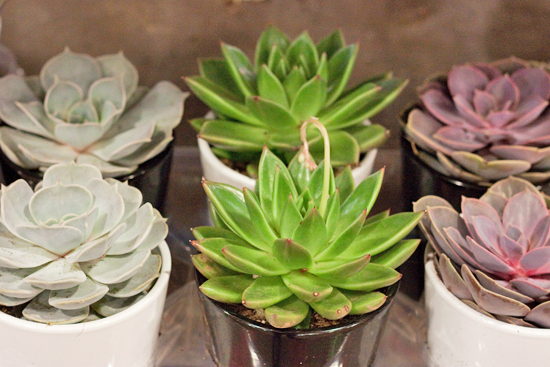 Cut succulents come in a range of sizes…mini, medium and big. And they come in boxes of assorted varieties. Dennis Edwards Flowers is one of the wholesalers who stocks them. 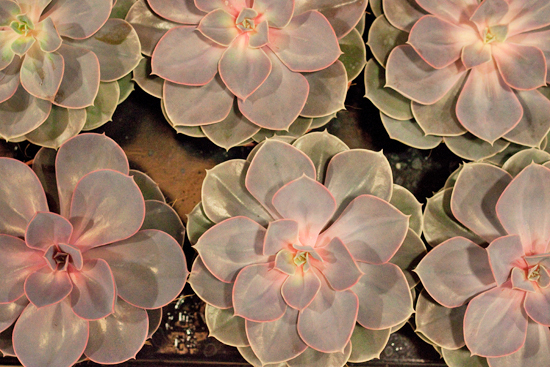 And Echeveria tend to be the most widely used type for wedding and event work. 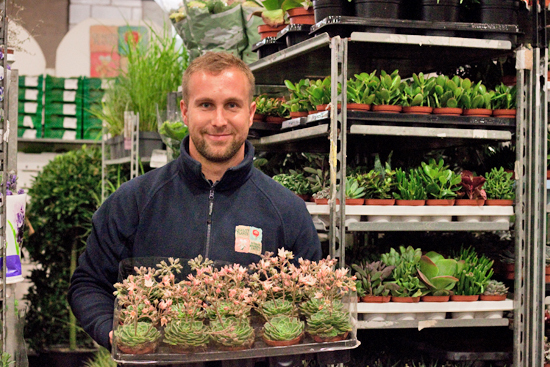 Several wholesalers stock succulent plants at Nine Elms including Quality Plants, Pratley, Evergreen and Arnott & Mason. Echeveria are very popular. They have fat, waxy leaves which grow in the shape of attractive rosettes. They're available in a variety of colours and sizes. And sometimes have brightly coloured flowers in pink, yellow or orange on upright stems. They can either be bought in trays of one type or mixed. Variety names include 'Metallica', 'Lilacina', 'Blue Prince', 'Black Prince', 'Perle von Nuremberg', 'Miranda' and 'Red Ruby'. At Arnott & Mason, you'll even find them in ceramic pots! 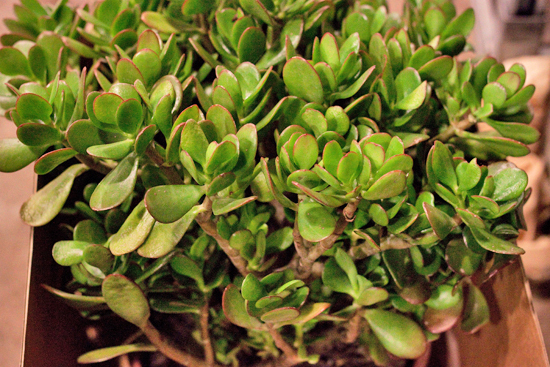 Crassula are named after the appearance of their thick leaves, as 'Crassus' means 'fat' in Latin. They come in a range of sizes, from small pots to very large containers. And Feng Shui fans will know that this plant, sometimes called a Money Tree or Money Plant, is a symbol denoting wealth. 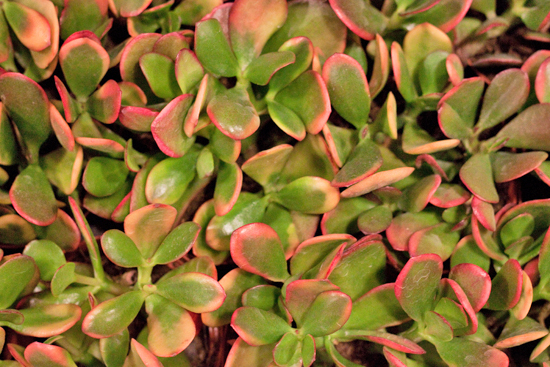 Crassula ovata 'Sunset' is a well-known variety. 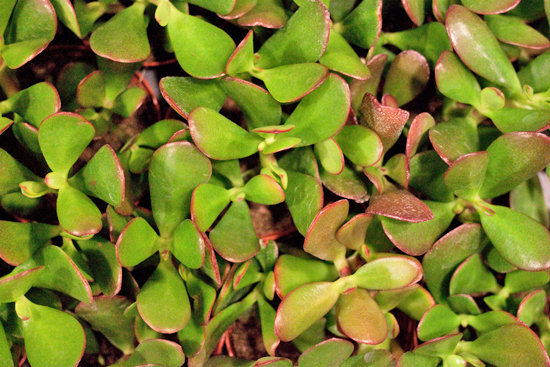 You'll also sometimes find Crassula ovata in an assorted tray of succulents. 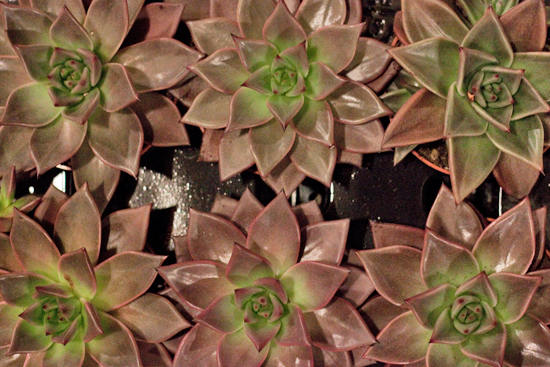 Edwin at Dennis Edwards Flowers says that cut succulents are very popular. He says: "They generally last 3-4 weeks. With the red varieties, depending on the time of year, they'll either be available as red or sometimes pink. We can get the green ones all year round. And if you know the particular name of a variety, we can order them in especially for you." 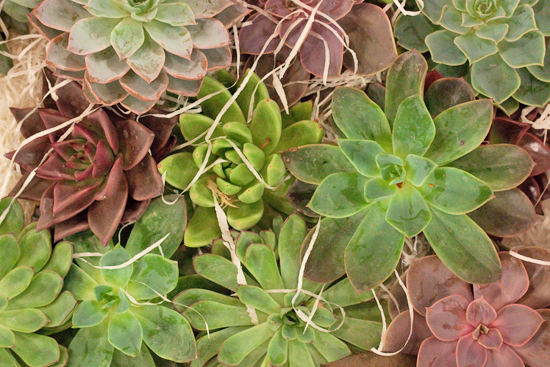 Dean at Quality Plants says that succulent plants are becoming more and more sought after. They like to have lots of light and only a little water. Keep the compost lightly moist from the spring through to the autumn and then water sparingly in the winter. Limp or shrivelled leaves indicate that water is needed. Either place them in a bowl of water for a few minutes and then drain, or water the compost, making sure to not wet the plant’s leaves, as they can easily rot. Handle the plants with care because the leaves can break off. Also, some varieties of Echeveria have a blue-grey bloom on the leaves which comes off easily...so take care when handling them. 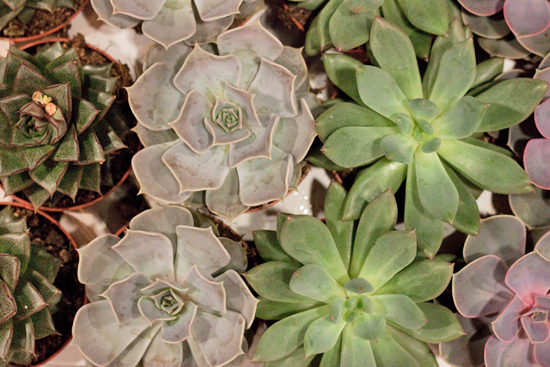 Whether used 'au naturel' or sprayed in metallic colours, succulents add a lovely texture and certain quirkiness to arrangements. As cut succulents are able to cope well out of water, there are many different ways that they can easily be incorporated into designs. 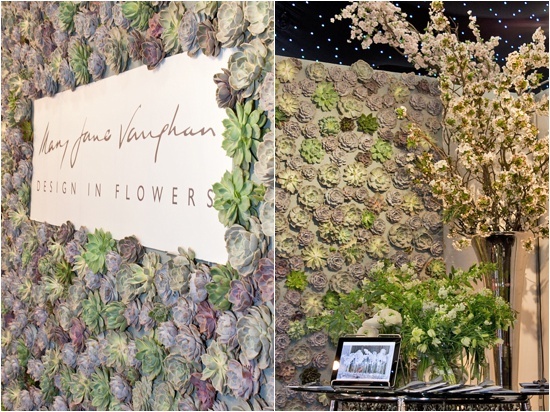 For example, at Brides the Show in March, Mary Jane Vaughan used them to create a statement wall. Her stand was absolutely stunning and won the Editor's Gold Design Award. 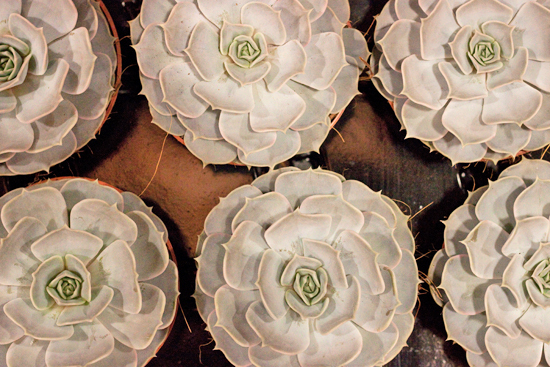 Wired, succulents can be used in buttonholes, bouquets and jewellery. 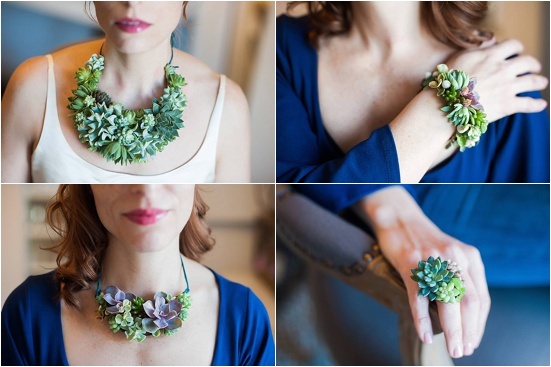 Here are some incredible jewellery designs by Michigan-based florist Susan McLeary of Passionflower. 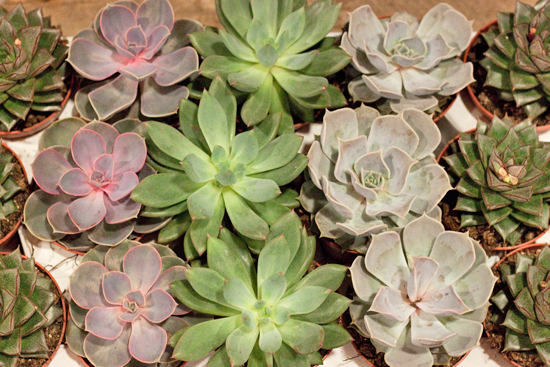 At weddings, potted succulents can be used as place card holders, favours and table decorations. 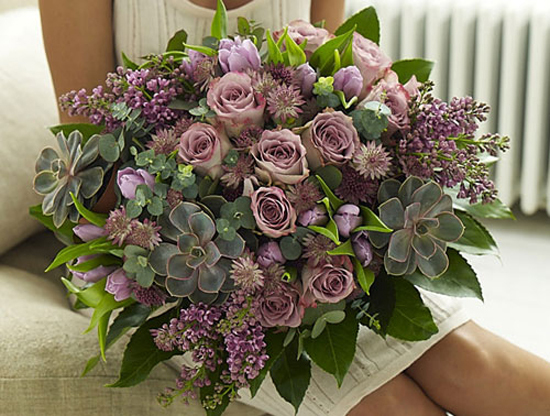 Using succulents in gift bouquets is also becoming popular here in the UK. Simply secure each plant to a rod to incorporate it into the design. 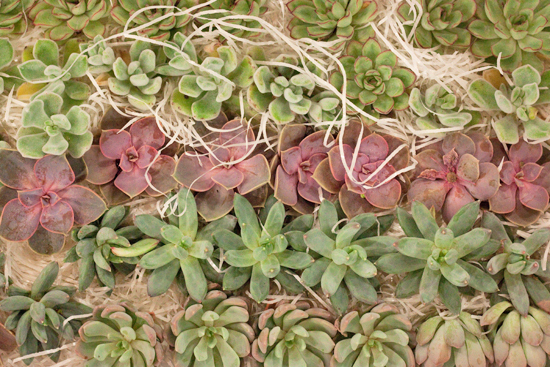 Here's a beautiful hand-tied featuring Echeveria plants by Jane Packer. And here's a link to a floristry demo by Susan Lapworth from Jane Packer at the New Covent Garden Flower Market College Day 2012, which includes images of Susan making a bouquet featuring succulents. The fact that these plants retain water for longer periods of time than most other plants makes them a great choice for contract work and also as houseplants. And due to their long-lasting nature, you could include them in a wreath, string garden or terrarium design.